We have been friends for a while, possibly in real life, but certainly on this social networking site, which is far more important at the moment. You are a priest of the Catholic Church. I am pretty good at ecclesiology, and having studied and discerned ordained and non-ordained ecclesial ministry my whole life, and I am quite sure that the norm of celibacy is still in force for the Latin Church. I have a deep respect and love of Eastern Catholic Churches, which generally allow their diocesan clergy to wed, but I happen to know that you are thoroughly Latin. That being the case, unless you are an Anglican priest or Lutheran pastor who has come into full communion since your ordination, you are not married. Please change your relationship status. Yes, I know you are not alone, and it is not a clear cut choice. There is no “celibate” option on the relationship status list, last time I checked, so you and your brother presbyters have to choose between “single”, “in a relationship”, or “it’s complicated”, etc. Several of you have opted to present yourself as “married”, but I suggest this is not a good idea. Primarily because, well, you are not married. You could say you are single, which is the most obvious true choice. The problem is that it might imply that you are available, and if you are chaste in your celibacy, as I am sure you are, then you are not available and I can understand that you do not want to give that impression. You could say you are in a relationship, or that it is complicated, indicating you are not available, but neither are you engaged or married. These might be better, because, again, they are honest descriptions, though hopefully your commitment to your orders is not really that complicated. And it never says what kind of relationship you are in, so this could work. But the one thing you are not is “married” (nor “engaged”, for you seminarians reading this). These very clearly indicate a vowed, committed lifelong relationship between two people that is a sign of love and union, and open to children. 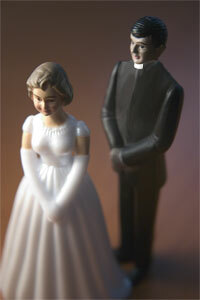 If you are religious you are in a vowed relationship as well, but it is not marriage. If you are diocesan (secular, for you old-school types), you are not even in vows, but an oath of fealty to your bishop. Sure, back in the day when local churches elected their own bishops for life, it was spoken of as “being married to the church” – but when princes and popes took the power of placement away from the people, and when bishops began to move from see to shining see with impunity, the analogy began to break down. And, sure, we can joke about people being “married to the job” because of their commitment and dedication, but these parallels and analogies are not the real thing. As Catholic Christians we view holy marriage as a sacrament – Pope John Paul II called it the “primordial sacrament” – and we should not treat it lightly. For that reason too, as well as respecting the human person, it is probably not a good idea to refer to your breviary, your calendar, or your bishop even jokingly as your “wife”. While we are on the topic of mixed messages – please do not wear a wedding band. You are not married. Symbols are powerful. Consider if all the baptized and confirmed began wearing a stole as a symbol of their priesthood. Even though based on a true doctrinal reality – that by Christian Initiation all share in the priesthood of Christ – we reserve that particular symbol for a particular participation in His priesthood: that of the ordained bishop, presbyter or deacon. Similarly, the wedding band is reserved for those who actually participate in the sacrament of marriage, not a parallel image, no matter how sincere the intent or worthy the service. If you want to begin a petition for Facebook to offer a “celibate” or “vowed religious” or even “consecrated virgin” relationship status, I will “like” it. I hope you can post an honest descriptor on your page, showing to the socially networked world the sacrifice you have made “for the sake of the kingdom”. Until that time, however, please help me in supporting the traditional definition of marriage… by removing it from your profile. your (unmarried) brother in Christ. By A.J. Boyd in Church and World on July 10, 2011 . Nicely done, and I fully agree. I have many friends in the clerical state, and there is certainly a wide variance in praxis on this point.